As the first Hispanic and only the third woman to be appointed to the US Supreme Court, I was excited to dig in to Sonia Sotomayor's story, particularly as told in her own words, and it did not disappoint. I have ventured to write more intimately about my personal life than is customary for a member of the Supreme Court, and with that candor comes a measure of vulnerability. I will be judged as a human being by what readers find here. There are hazards to openness, but they seem minor compared with the possibility that some readers may find comfort, perhaps even inspiration, from a close examination of how an ordinary person, with strengths and weaknesses like anyone else, has managed an extraordinary journey. Though she describes herself as "an ordinary person", I found Sonia Sotomayor to be anything but. I would never claim to be self-made--quite the contrary: at every stage of my life, I have always felt that the support I've drawn from those closest to me has made the decisive difference between success and failure. 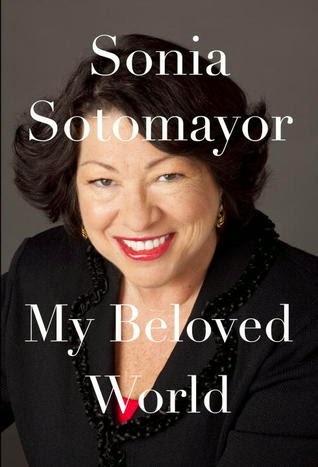 Sotomayor sprinkles advice throughout the pages of her memoir, tidbits that directed her life in positive ways, like "don't be shy about making a teacher of any willing party who knows what he or she is doing". Or stressing the importance of "a good lesson in the value of learning to express your basic needs and trusting you will be heard." Or "Success is its own reward, but failure is a great teacher too, and not to be feared." Or "the key is always to watch and listen." Small, seemingly insignificant events translated into life lessons for Sotomayor. When some friends made prank calls to random numbers, telling each women who answered that they were having an affair with her husband, she "couldn't understand how anyone could be so cruel--so arbitrarily, pointlessly cruel. What was the pleasure in it?" When friend defended the practice as "just a joke", Sotomayor came to a realization. How could she not imagine?...Was it so hard to see [yourself] in the other [person]'s shoes? I was fifteen years old when I understood how it is that things break down: people can't imagine someone else's point of view. Of course, as a lawyer and later a judge, this ability to view events from a different perspective is incredibly valuable. Sotomayor used this gift to improve her arguments and courtroom skills, to listen carefully to what others are saying in order to better understand where they're coming from. As a woman of Puerto Rican descent, she became deeply involved in organizations that worked to increase the number of Latinos/Latinas in higher education and in the legal profession, while asserting that "no group is an island" and "to do good ultimately meant seeing any particular interests in a larger civic context, a broader sense of community." Her love of continuous learning comes through frequently. When asked what she hoped her legacy would be as a Supreme Court justice, she responded, "My highest aspiration for my work on the Court is to grow in understanding beyond what I can foresee, beyond any borders visible from this vantage." She describes constantly watching, listening, asking questions to more fully understand other people, their motivations, their actions, their hopes and dreams, the context in which they live their lives. Linked to that love of learning is an optimistic belief in other people. "I'd always believed people can change; very few are carved in stone or beyond redemption." She also believes in the power of connecting with others and working together. "There are no bystanders in this life," she shares. "Our humanity makes us each a part of something greater than ourselves." "It's because you can't just take a stand," she said, looking at me with such earnest disdain that it startled me. "Everything depends on context with you. If you are always open to persuasion, how can anybody predict your position? How can they tell if you're friend or foe? The problem with people like you is you have no principles." ...I have spent the rest of my life grappling with her accusation... There is indeed something deeply wrong with a person who lacks principles, who has no moral core. There are, likewise, certainly values that brook no compromise, and I would count among them integrity, fairness, and the avoidance of cruelty. But I have never accepted the argument that principle is compromised by judging each situation on its own merits, with due appreciation of the idiosyncrasy of human motivation and fallibility. Concern for individuals, the imperative of treating them with dignity and respect for their ideas and needs, regardless of one's own views--these too are surely principles and as worthy as any of being deemed inviolable. To remain open to understandings--perhaps even to principles--as yet not determined is the least that learning requires, its barest threshold. As someone who has been accused of a similar failing, I appreciate her defense of context and individual situations, and the use of our God-given reason above the intractable application of absolutes. Striving to understand the world from another person's point of view helps create a better community and, ultimately, a better "beloved" world.